When is an emergency not an emergency? Statistically speaking, almost all the time. According to the CDC, of the nearly 140 million yearly visits to the ER, only 12 percent result in a hospital admission. And some estimate that about 75 percent of ER visits could be treated elsewhere. Many people believe that the ER is the fastest way to get care, but that’s far from the truth. Here in North Carolina, even big hospitals struggle to get people seen on time. Many patients wait more than an hour just to see a doctor, and a few spend almost four hours between arrival and going home. Why the ER in the First Place? There are many reasons people find themselves at the ER rather than at their doctor’s office. Most often, it’s because primary care doctors close at 5 p.m. In fact, a recent study found primary care doctors are getting harder and harder to reach on evenings and weekends. And with primary care shortages an issue around the country, especially in rural areas, that problem is just getting bigger. Now, generally speaking, if you’re having health issues you should try to visit your primary care physician. Many doctors’ offices offer same-day appointments, so you should check there first. If you can wait until morning is a good bet if you’re not experiencing a true emergency. These are usually issues like a persistent cough, a headache, or a sprain you can keep iced. #ER or #UrgentCare? Find out how to make the right call. If you can’t get a same-day appointment, urgent care centers are another option. Across the U.S., there are more than 9,000 urgent care centers with over 20,000 affiliated doctors. Their aim is to treat patients quickly and efficiently. In North Carolina alone there are more than 250 dedicated urgent care clinics like FastMed Urgent Care, plus more than 400 walk-in clinics, including 73 retail clinics (like Target clinics, Wal-Mart clinics, and the Minute Clinic from CVS). Most of these are open seven days a week, and 80 percent have extended hours, including weekends and evenings. Some areas have around-the-clock urgent care options, too. That’s to say nothing of the cost. The average cost to provide services at an urgent care clinic visit is around $150, which is about a tenth of the average for ER visits. As a patient, your copayments generally run much higher at the ER. And remember those long wait times, with patients waiting almost four hours at some big North Carolina hospitals? Not so with urgent care. In fact, most urgent care centers clock in around an hour for the whole visit, and anywhere between 15 to 30 minutes to see a doctor. We all know it’s hard to think straight when there’s an injury or illness involved. Knowing where and when to get help isn’t just about saving money, it’s about getting care fast so you can get on with your life. 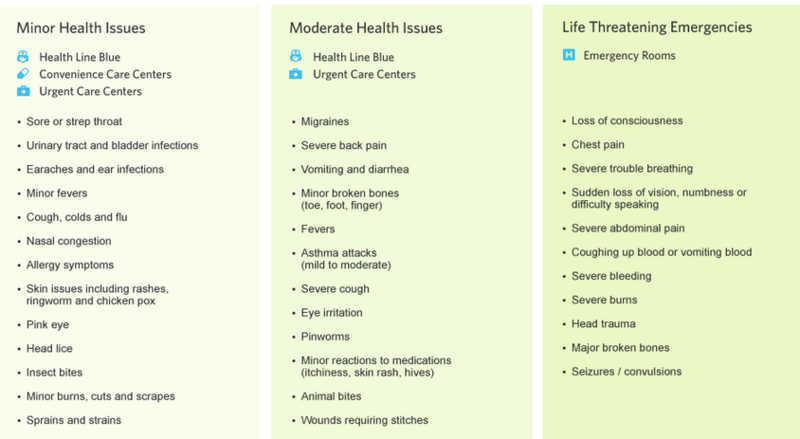 To find an urgent care center in North Carolina, you can use our Urgent Care Finder tool. Not sure where to go? Check out the chart below for a list of common issues.